Americans struggle with Spanish, but particularly struggle with the irksome task of having to figure out who to call tú (informal “you”) and who to call usted (formal “you”). Making matters worse, there are no standard rules that apply between countries, or even cities within the same country. And there are certainly no standard rules that exist between age ranges, gender, and class. There’s really no equivalent cultural calculation in English, and your good manners are at stake in every interaction. Use too much tú, and people think you’re too chummy. Use too much usted, and people think you’re a Mormon missionary trying to smile your way into a conversion. Argentina, as in most things, defies these rules and has decided, as a society, to apply vos an antiquated ultra-formal way of addressing royalty, landowning elites, and other snobs to the hoi polloi. What I didn’t realize until recently, however, was how vos shapes Argentina’s singularly egalitarian social conventions within Spanish-speaking Latin America (Brazil’s use of você is a much different beast). Arriving in Argentina to study part of my junior year of college, I was placed in the care of the one-and-only Estela Mantega and José Cohen, a sitcom of an older Argentine couple with a spacious apartment in the city’s fashionable Barrio Norte. While my formal education took place during the day, I learned much more about my host country at the dinner table from Estela and José, often over one of her delicious Spanish tortillas with chorizo. One of the first things Estela told me was to stop using “usted” with people and prefer vos. Skeptical, I asked her who you use “usted” with in Argentina. Her response, which has served me masterfully through my 15 years visiting the country: “anyone over the age of 80, oh, and taxi drivers”. Estela was right. 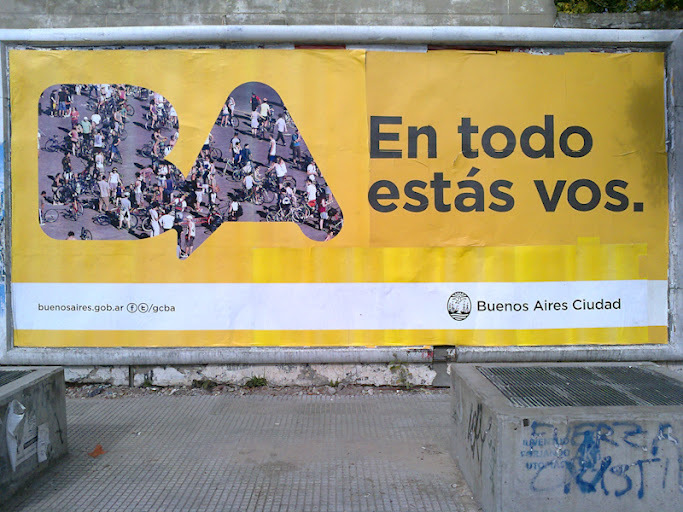 The government communicates in vos to citizens, the bus stops use vos to indicate where you are on a map, and advertisements use vos and its odd conjugations to get people to part with their pesos. Very elderly people appreciate the convention, and usted helps you keep your distance from taxi drivers, who are almost never to be trusted. See, Latin America, buoyed by “usted”, can be a very formalistic place, even if it looks a little ramshackle sometimes. The respect that people are showing you with “usted” is not a respect you’re projecting onto others through courtesy, rather from a culture of deference and privilege that everyone has been forced to accept. From Colombia to Chile, Latin America has some of the highest social inequality rates in the world. It has many societies whose privileges were baked in during colonial times, independence movements, and early commercial development, and that still persist today. It also inherited Spain’s culture of inherited governmental, royal, and societal privileges. Argentina is no exception to this rule (although scrappy little Uruguay, which also uses “vos”, can claim one), and subsequent economic crises have only served to worsen the country’s structural economic gaps. But “vos”, and the associated sense of self as equal to others, is a big departure from usted’s social wrath across the continent. When “you” means “you”, and not more, or not less, people start to look at each other differently. In Argentina, visitors and residents alike are quickly reminded that nobody is better than anyone else, and anyone who acts as such is quickly cut back down to size.